It seems all it takes to bring me back is a couple of good, long downhills. As part of my take-it-easy strategy, I was set to ride a comfortable 33 miles to Troutdale from Wytheville. I felt ok. Legs were still a bit tingly, but I had enjoyed a nice dinner at The Log House restaurant (which was such an eclectic place that I’d recommend it just to look inside. You don’t even have to eat there), and taken a bit of a stroll around historic downtown. Nice to just walk. I managed to get all my junk sorted and packed in reasonable time and waved a jaunty mind-goodbye to my $44-a-night hotel. A place that does the job but does not trust guests with plugs in neither sinks nor baths. I figured I could probably knock out those 33 miles by lunchtime. Even if I had a bad day. The mist clung low to the tops of a few hills, and I relished the feel of the cool morning air. It truly is the best time to ride. I’m not going to complain about hills today. Sure, there were a few long ones right at the start, but they were straight and kinda dull – nothing like the ones I’ve been doing in terms of steepness. I just plodded up. It’s all you can do. According to the elevation profile, the road to Troutdale was mostly rolling hills of varying steepness and that’s what I was dealing with. The one I was most worried about was the one leading up to Troutdale. It looked reasonably steepish and leg threatening on the chart. I’m still feeling quite delicate and a little gun shy about real climbs. A sense of hill-dread is a heavy coat I’m wearing. And I know the worst is still to come. 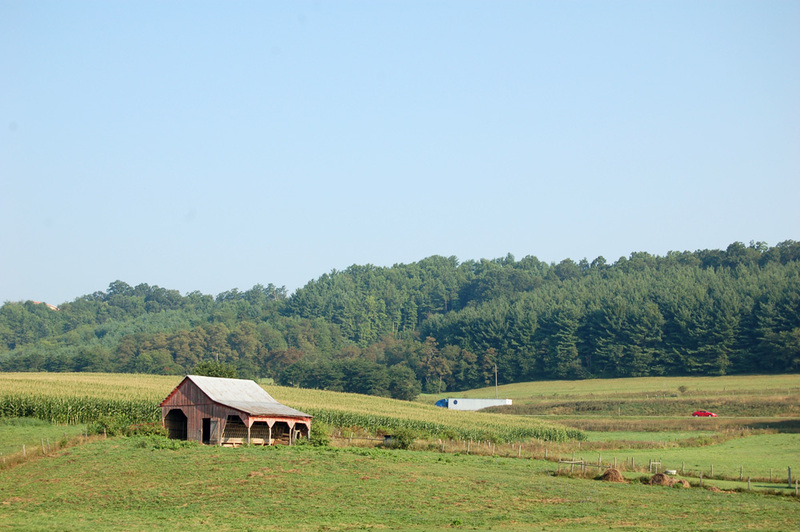 The countryside was mostly open farmland. I could see in the distance the haze of rows of mountains, lined up like a choir. Is that my future? Probably. I’ll deal with that when I get there. Meantime, I talked to cows, counted roadkill, admired pretty flowers, and pulled up quickly when I spied an emu casually strolling beside a fence. And then the farmland gave way. Just outside Sugar Grove, I turned a corner and saw the road disappear in front of me around a bend into forrest. I’d been admiring a hump of a mountain that broke the scene and was now about to climb up it or around it. Or something involving tree-lined roads. Welcome to the Jefferson National Forrest. Just gorgeous. Plenty of shade to ride in, not too many hills. In fact, although I was climbing on and off, they were gentle to the point of soothing. I stopped to take a picture and a car pulled up and stopped beside me. In it, a couple. Oh, jeez. I don’t remember anybody. I’m terrible with faces and names and all sorts of things involving memory. Turns out it was Chris, one of the cyclists I met the day before the crash in Ashland. (He was riding with Adam, the guy who rode with me on the first day back.) I’d completely forgotten he lived in Rural Retreat. We had a bit of a chat and he said that I should go to Damascus and not Troutdale. That there was nothing in Troutdale. I kind of knew that, but there was a free cyclist hostel in Troutdale that was recommended to me by the cyclist I met a few days previously. Best hostel on the trail, he’d said. This gave me pause. Damascus was to be my next day. Twenty five miles. If it was all downhill, perhaps it would be possible. But there must have been some reason I had set it up that way. To do those miles tomorrow. We chatted some more about the crash and he wished me luck. Off they went and off I went. Weird how you can run into someone out in the middle of nowhere. And then I was at the top. I was grinning like a fool. That was the best climb ever. If they were all like that, I’d be fine. I’m not saying it wasn’t hard, but the fact that it was a slow, long climb made it very tolerable. About half way down the descent into Troutdale, I spied a touring cyclist stopped on the side of the ride coming up. OMG! Another cyclist! Of course I stopped to chat to him. He’s only the second one I’ve seen. We chatted for quite a while (since I don’t see people, I tend to blather on) and he – his name was David – also recommended I go to Damascus, saying it was a fun little town full of hikers and a bike shop if I needed it. But he never said it was all downhill, so we looked at the map together and discussed the one climb. He made me think that maybe I could in fact tackle tomorrow’s ride today. It’s was only noon. I had kept my time goal for the day and had all this extra time to kill. I flipped open my bag to get him a card. “Ah, you’re obviously not deterred by weight,” he said, having just spied my camera. No, I am deterred by weight. Just mostly when it’s on my body. Boom-tish! It was really fantastic to talk to another cyclist coming the other way. And such a friendly one. He recommended I stay at The Hiker Inn, which has a hostel out the back, but rooms in the house if you want to pay a bit extra and get a bed. That sounded pretty sweet. I filed it in the empty chasm of my brain where the name of it got lost immediately. I finished the descent into Troutdale and stopped for lunch at Jerry’s Kitchen and Goods. It was large inside, with plenty of tables and about 4 people. I sat down and was approached by a very friendly server who proceeded to tell me about the special. Two country fried steaks with white gravy, beans, mash and a roll for $6.95. I promptly ordered that and was introduced to the joy of this meal. Holy moly. It was hot, creamy and delicious. When I went to pay, I told her I had never eaten anything like that ever before. She proceeded to tell me about a couple who had come in from “that Manhattan” and told her she should open a restaurant in New York. She didn’t exactly laugh at the idea, but explained that it’s just so hard to keep a restaurant open and she liked it there. I liked it there. So good. I decided to do it. To push on to Damascus. The road was a little less sheltered for the start and I began going a slow uphill almost immediately. There was a lot of horse action on this stretch, and I even passed a sign for a Horse Camp (or something). It’s so nice that even the horses get a camp to themselves. Signs for Mt. Rogers were everywhere, plus places where hikers could get on the trail and go climb it. There’s plenty more Appalachian Trial signs in my future, but I still get a bit of a buzz out of seeing them. Every so often, I would pass by a stream, bubbling on over rocks and looking very inviting indeed. It wasn’t long before I was at the top of this climb as well. And then, oh boy. The most glorious descent. Four miles of blissful slow downhill with just enough gentle curve to keep you on your toes and beautiful scenery to keep your senses enthralled. It was so nice just to cruise. After it petered out, I began another slow and relatively easy climb before hitting ANOTHER long, slow descent. The final one into Damascus. This one was even more woodsy, even more touristy, and passed by the Virginia Creeper Trail. I saw many many vans coming up the hill to the trailhead, loaded with rental bikes. They shuttle people to the top so they can ride down the 11 miles to the end. But I stayed on the road, loving every minute of being alive. I needed this. I needed a day of positive reinforcement and non-white-knuckled downhill where I didn’t need to constantly feathering the brakes so as not to die on a viscous switchback. As I rolled into Damascus, I’m pretty sure I had a grin that exceeded the perimeter of my face. I was still grinning while standing on the main street and looking at the words ‘no service’ on my iphone. Fortunately, I was able to turn on my MiFi (from that other company), find the name of the place David recommended, then use Skype to call. I was a little worried that since it was the weekend, there would be no place to stay because of all the hikers in town. But the lady who answered the phone, Suzanne, had a room and told me she would put a beer in the freezer and it would be cold in no time. The Hiker’s Inn is pretty much someone’s home and you get to stay in a room in it. Suzanne rents out the top rooms in the house, does your laundry for $4 and if you’re lucky and there’s plenty to go ‘round, she makes you dinner. I was very lucky! Not only did she make spaghetti with sausage for dinner (with edamame from her garden), she made me a peach dacquri with peaches from her tree. We sat together and ate, Suzanne, myself and a hiker named Nature Boy. We had a really good chat. Nature Boy (Willy), has walked the Appalachian Trial three times. To me, that is unfathomable. I dicked around for a bit on the internet after dinner, then went to bed. What a great day! Since I made up a day, I could push on to Breaks, or… I could stay in Damascus for the day, get a massage (yay! ), and perhaps even ride the Virginia Creeper Trail? Yes, that sounds palatable. But first, more important matters. Off to find some breakfast. So heart warming to read this post, almost as if I was there. Nice to see how you are received by people…and they seem to enjoy what they do, too. Please remember to ice the wrist for future bliss. great post about a great day. I’ve been thinking about your previous post, the one that says something about if you make it through the first 10 days, 95% of the trans-America riders complete the ride. That really struck me. The more I thought about it, the more it made sense. today, so many of our “trips” or “adventures” don’t last long enough to be about more than the *departure* and then the *arrival*. There is no *journey* in between. You have to hang in there long enough to leave the *departure* behind and to become involved in the *journey* itself. Then, it’s all about the journey, until you get close enough to the end that the *arrival* draws you to the finish. Here’s hoping you find your journey soon. It seems that today’s post points in that direction. Good Riding, Noodle. I’ll be following via the InterWebs. Way to go come back girl! No more white knuckle descents. Happy to hear things are going well on the road. Glad to see your mood perk up. You rock!